THEM Anime Reviews 4.0 - Alakazam the Great! Distributor: Currently licensed by Orion Pictures. Notes: Based on the manga My Son Goku (ぼくのそんごくう Boku no Son Gokū?) by Osamu Tezuka. 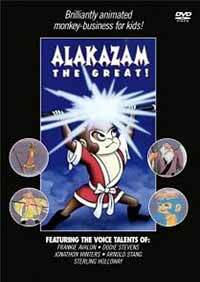 Alakazam is a simple monkey who becomes more than a bit of an arrogant jerk when he's made King of Beasts. After extorting the magician Merlin (!) into teaching him all his magic, his hubris leads him to take on King Amo (Buddha) in Majutsu Land (Heaven) in a contest of magic that does not go well for Alakazam, and he ends up imprisoned inside a mountain until a journey with Amo's son Prince Amat offers him a chance at redemption. Anyway, Toei Animation made this version of Journey to the West (originally named Saiyuki) in 1960, which was so long ago that even Grampa was only 5. I bet you can't even imagine so many years ago, children. Now in those days a lot of movies were needed in the U.S. market, especially for kids. There was something called the Saturday Matinee, where you could see, for a quarter (or maybe it was 50 cents? ), so many movies that I think it would cost you $50 today. (Please don't trust Grampa's math- he's kind of shaky on that these days- Mr. Reviewer.) There was also something called the drive-in, where you could see movies in your car. No, that's NOT like your Uncle Dennis' car, where he can lower a little screen in the back and let you watch Scooby-Doo!. Scooby-Doo! is very bad for you, you know. (Yes, it is. Very, VERY bad.- Mr. Reviewer.) No, this was on a BIG screen, but you sat in your car, and you put a big speaker on your side window, and sometimes you had to drive around a lot to find a speaker that really worked. Anyway, they also sometimes had more than one movie at each show, and sometimes parents took their kids; and sometimes people WITHOUT kids went to the drive-in without even caring what was happening in the movie. Grampa might have even done that himself. I'll try to finish this up while Grampa takes his nap. He DOES go on, doesn't he? Tezuka's treatment of Journey to the West emphasizes the Monkey King character, whose name in Tezuka's original manga was Son-Goku, so now you know, if you didn't already, what inspired a certain character in a certain anime that starts with D. Even Tezuka's adaptation is a loose one, of course, I doubt that the appearance of an English wizard is exactly authentic in a 16th Century Chinese story. Still, despite the obvious love the Japanese have for this Chinese fairytale allegory, Alakazam might be one of the more faithful treatments of it in anime. Enoch has a THEM review of a 50-episode 2000 TV series called Saiyuki that, from his description, sounds like not just a loose, but an actually flaccid adaptation that deviates to an incredible degree from either the facts or the spirit of the original story. One I AM familiar with, the bizarre parody of it in an episode of Love Hina, actually sounds truer to the spirit of the story, and to tell the truth, since the Monkey King is supposed to be arrogant and violent, Naru Narusegawa is ALSO a better choice to play the character than Alakazam's voice actor. I won't go into the issue of who actually wrote the songs attributed to Les Baxter here, but they are pleasant, if unmemorable, exercises in the pop song style of the era. (A barbershop quartet/Greek chorus of monkeys was kind of clever.) The artwork and animation are similar to what Fleischer and Warner's were doing in their shorts, but seems to me inferior to Disney's feature film work of the time. I didn't spot any of Tezuka's rather distinctive character art here, or for that matter even any of his heavier considerations of ethics beyond the simple theme of an arrogant character learning kindness and mercy. I'm not always in agreement with Tezuka when he dives into deeper philosophical waters, so I'm perfectly OK with the simple magical adventure story with a basic moral framework that we're given here, though a modern viewer may label it trite and naïve. The show also comes across as sexist, but I think that this is a problem that could largely be laid at Tezuka's feet. As I said in my review of Phoenix, he liked female characters who were sweet and supportive and not much else, and DeeDee certainly fills the bill, though she does try to gently cajole Alakazam out of his (frequently) poor decisions, which I guess was OK for females to do even in those days. Grampa, go to sleep. I swear, if you keep this up, I'll wind up talking to myself. Recommended Audience: So innocuous now that it's kind of embarrassing. Pure G rated. Version(s) Viewed: Streaming on Netflix.